The Imperial Picture Palace was located on Moseley Road at the corner of Clifton Road in the Balsall Heath district south of Birmingham city centre. It opened on 26th January 1914 with the Italian silent film “Satan’s Castle and John Bunny in “The Pirates”. It was designed by architect L.L. Dussault. In 1927, it was reconstructed to the plans of architect Archibald Hurley Robinson, and the architectural firm Satchwell & Roberts, when the building was extended and a balcony installed. It re-opened on 14th November 1927 as the New Imperial Cinema. Taken over by the Associated British Cinemas(ABC) chain in October 1936, it was re-named New Imperial Super Cinema. It was closed as a regular cinema on 13th April 1963. It was taken over by independent operators and re-opened as the Imperial Cinema, screening East Indian ‘Bollywood’ films. This closed on 3rd March 1983. The Imperial Cinema re-opened again screening regular release films, and was taken over by the Council as a community centre, still screening ocassional films. It has now been demolished, and in the mid-2000’s, the site is an empty plot of land. The Imperial Cinema started running concerts in 1981 alternating with films until 1983 when it became the Everyman Theatre for a while then The Cave (both “community arts” venues). 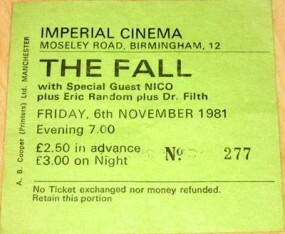 In the short time it held concerts bands included The Fall (above), New Order, and Echo Base (a local band – one of whom went on to Ocean Colour Scene). Not surprisingly, there were frequent complaints from residents even though there was either a major road or a railway between it and the nearest housing. 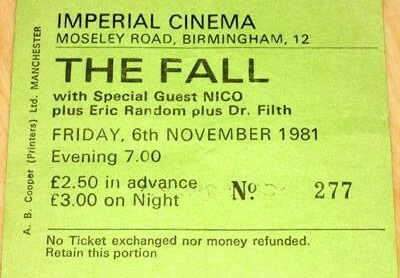 I remember the Fall gig over-ran massively leaving a couple of dozen remaining seated on the uneven (and not particularly clean) floor listening to Nico at around midnight. Dead Kennedys/Drongos For Europe – 02 October 1981. The audience were wild at this one, but the atmosphere was incredible. Jello Biafra took a great disliking to the gap separating the stage from the audience and regularly hurled himself across to join the fans in the mosh pit at the front. About half way through the monitors broke down and Jello entertained the audience with dirty jokes and stories for about 20 minutes (a drum & bass version of Drug Me was also performed during this break). When the equipment came back on, Jello again leaped into the audience and the gig ended in great style. Discharge were playing across town in the Cedar Club on the same night, much to Jello’s delight and he made the trip across town to join in the audience there. The Fall/Nico/Dr. Filth – 03 November 1981. Another interesting gig. 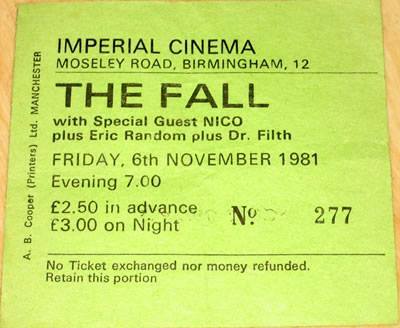 The Fall actually came on before Nico & I don’t think Mark E’ Smith was too pleased about it. It was a touch and go Fall gig & Mark spent a lot of time going back stage. Nico closed the evening and left a lot of the audience bemused – I don’t think they really knew who she was, which was a shame. Bauhaus/Dr. Filth – A great performance from Bauhaus, although Pete Murphy was extremely pissed off about the stage/audience divide. after about three quarters of the set had been performed, he picked up a cymbal, using it as a theatrical prop to help with the song Terror Couple Kill Colonel. Before the song finished, he hurled the cymbal violently into the gap, causing the audience at the front to recoil back in panic. Murphy then completed the set and the band left – with no encore.